Turning the lights off is never an option, but we can always find ways on how to make your hardware maintenance as cost-efficient as possible. Organisations want to spend more time and resources for innovation. Unfortunately, more than 50% of the IT budget is spent for keeping-the-lights-on (KTLO) activities. Gartner says it’s 80-85% while Forrester states it’s 70-75% of the tech budgets. Regardless, the point is, a very large chunk of the enterprise IT budget is allotted just to keep the system running. According to Gartner, the need for cost optimisation particularly for post-warranty and EOSL (End of Service Life) data centre and network devices, drives the increasing demands for alternatives to OEM support. A mapped view of the enterprise network infrastructure allows you take an inventory of your IT assets and provides comprehensive information of your entire network. With a visual understanding of your network topology, your IT team can easily identify possible choke points and help you troubleshoot when an issue comes up. This is also a crucial step to identify what your organisation require from what the OEMs say you need. It will help you assess whether you truly need that new product series and the maintenance contract upgrade they offer or not. Companies often renew maintenance contracts because of status quo. You’ve probably been doing it for years or your predecessor did, but your business needs have changed over time. Make sure that the service level agreement (SLA) suits your requirements. There is no point renewing it when you can not maximise it or it no longer matches your enterprise needs. It’s not a dead end. If your current contract is no longer working for you, know your options. If your current vendor does not offer flexibility with their SLA, a third-party hardware maintenance or TPM (third-party maintenance) provider can offer you your needed maintenance hardware support, especially for your post-warranty data centre equipment. 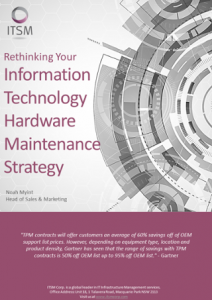 With third-party hardware maintenance, you can free more than 50% of your IT budget and divert it to innovation or to purchasing additional equipment. Identify your IT infrastructure pain points and let us develop a hardware maintenance strategy. Talk to an ITSM consultant now at +61 2 8355 1080 or click the image below to schedule a free online assessment by our IT expert.